I have boxed chocolates suitable for gift-giving available from now until Valentine Day. One box free per tenant. I don't like the candy that you usually find in Valentine Day heart-shaped boxes - fruit-flavored creams and sticky fondants with no particular flavor at all, all covered with second-rate chocolate. My least favorite is maple. Lemon cream is a close second. NEW IN THE CHOCOLATE SHOP. Walnut Brownie Mix. I have never had a good brownie that was made from a boxed mix. Have you ever read the ingredients on a box of brownie mix? Even the expensive brands are made with hydrogenated oil, artificial flavors, preservatives, and a long list of unpronounceable chemicals. I make my brownie mix with organic unbleached flour and Hawaiian cane sugar, and I vacuum seal it in Mason jars, so it doesn't need preservatives. If the brownie mix proves popular, I'll add other mixes to the line. I'd like feedback on this item. If it can be improved, I want to know. A contractor who has been trying to get business from me sent me a gift pack of Vosges chocolate bars last month as a Christmas present. He bought them at Neiman Marcus in San Francisco. I think this guy assumed that these bars had to be good because they were: 1. expensive, 2. contained bizarre ingredients, and 3. were made in France. Each bar weighed 3 ounces and cost $10.00. I tried the "Bacon Bar" first. It was a milk chocolate bar filled with bacon and "smoked salt." It was awful! Bacon does not work as a chocolate bar ingredient, and it was too salty. You should never add salt to bacon. Bacon already has a lot of salt in it. I also got a dark chocolate bar filled with wasabi (Japanese horseradish), a white chocolate bar filled with kalamata olives, and "Red Fire", a dark chocolate bar filled with "hot Mexican ancho & chipotle chillies." I didn't eat those bars. If anyone wants them, they're yours! Bon apetit! FREE BERKELEY NUT CO. HOODIES AND BASEBALL JERSEYS. Berkeley Nut Co. hooded sweat shirts are back in stock. I have them in sizes Small, Medium, Large, and Extra Large. These are really top-quality hoodies. The first one is free. If you already got one and want another, additional hoodies are $10.00 each. I also have Berkeley Nut. Co. baseball jerseys. These jerseys have a 3/4 length raglan sleeve. The shirt is white and the sleeves are navy. The first one is free. When I was in college, February had 2 legal holidays: Lincoln's birthday, Feb. 12; and Washington's birthday, Feb. 22. All schools were closed, and every employee got both days off with pay. About 20 years ago, Congress combined Lincoln's and Washington's birthdays into "President's Day." This was done for 2 reasons. 1. The travel industry wanted more Monday holidays. The airlines and the hotel industry had a lot of gain by creating 3-day weekends. 2. Congress wanted to create a new legal holiday, Martin Luther King Day, but without adding to the total number of paid holidays in the year; so Lincoln's and Washington's birthdays were merged into one holiday. In a bizarre twist, the Virginia state legislature created "Lee-Jackson-King Day" as a state holiday. Robert E. Lee, Stonewall Jackson, and Martin Luther King, Jr. were all born in January. It seemed odd to me to name a holiday for Confederate generals who fought for the perpetuation of slavery with Dr. King. I was in Washington, D.C. about 10 years ago visiting relatives when I saw a poster in a Metro (D.C. subway) station promoting Lee-Jackson-King Day. The poster included pictures of Robert E. Lee and Stonewall Jackson in Confederate uniforms and Martin Luther King, all looking like best friends. I think I would have stolen that poster if it hadn't been glued to the wall so I could take it back to California as a conversation piece and as proof to skeptical friends that I didn't invent this improbable holiday. In 2000, the Virginia legislature made Martin Luther King Day and Lee-Jackson Day 2 separate holidays. To clean a greasy or sticky stove, use a little ammonia straight out of the bottle. A lot of people don't buy ammonia because of its strong odor, but nothing dissolves grease as well, and unlike most other cleaners, when ammonia evaporates, it leaves no odor behind - none at all. Ammonia works without rubbing or scrubbing. I recommend using paper towels rather a sponge when using ammonia to remove grease. You can throw used paper towels in the trash can, but it is often very hard to get grease out of a sponge. Never mix ammonia with other cleaning agents. A bottle of Parsons ammonia costs about $1. Have you ever heard of a Radarange? Thats what we used to call a microwave oven back in the 1970s. I became a landlord in 1971. At that time, the average 2 bedroom apartment in Berkeley rented for $150 a month, and a Radarange cost $495 (about $3,000 in today's money), more than 3 month's rent. Some landlords put Radaranges in their apartments, but only in the most expensive and luxurious buildings. Radaranges were very heavy. In 1971, a Radarange weighed 95 pounds! You couldn't put one in a cabinet or on a shelf. It was too heavy for that. When the price came down in the 1980s, I started putting them in my apartments and featured them in the listing information. 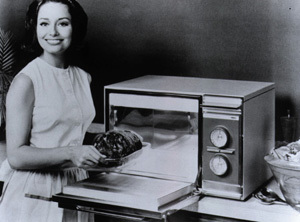 By that time, the name had changed to 'microwave oven', the price had fallen to $200, and the weight had come down to 40 pounds. After 1990, I stopped buying microwave ovens for my rentals. They had become so cheap that they were no longer considered a valuable amenity.